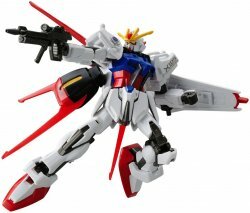 This is the 1/144 Scale SEED HG #1 Aile Strike Gundam Remst Plastic Model Kit from the Gundam Series by Bandai. Suitable for Ages 15 & Up. FEATURES: Highly detailed plastic pieces molded in different colors Snap together kit requires no glue Model can be posed in various positions Several hand held we..